Today was an early start for the team, in order to make best use of the sailing weather, before returning to Mare harbour to sit out the incoming storm. We spent most of the day in Choiseul Sound which is East of Mare Harbour, going through various manoeuvres with different sails, learning how the boat handles and getting a feel for the yacht and its equipment. We were accompanied along the way by numerous penguins, dolphins and even a seal! The scenery is very similar to the Western Isles of Scotland or North Wales, the latter of which we as a team have strong cold and wet memories. The sun was beating down on the deck causing a few red faces! There were also a few pale looking faces, due to the motion of the yacht (Alex and Shady). However our newest crew members, Dolly and Barbara had a healthy glow and have settled in having enjoyed their first day at sea. Lunch today was a rather basic affair after previous efforts…..ham & cheese sandwiches or tuna for the only vegetarian onboard, followed by copious amounts of wets (Tea & Coffee for those not fluent in Jackspeak) from Matt H. Tonight’s dinner is being kindly provided by Naval Engineering Falkland Islands in the form of a BBQ hopefully, if the rain stays away; if not then it’s pizzas at Mount Pleasant. 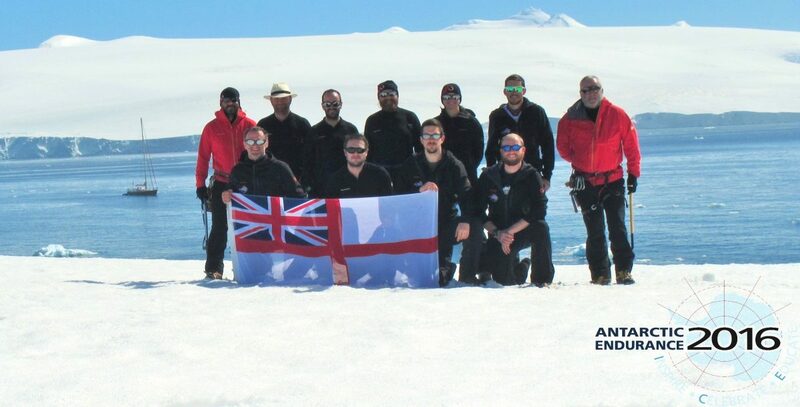 The team have now returned to Mare Harbour for 72 hours and are looking to depart for the South Shetland Islands, weather permitting, on Tue 26 Jan. Frustratingly the poor weather is taking longer to go through the area than originally expected, thus forcing us to delay by a further 12 hours. This will be reviewed regularly to check on progress of the low pressure system. Often half the challenge is simply getting to the start line itself, and this expedition has been no exception. Over two years of planning has been focused on getting us and all our equipment to this small remote island in the South Atlantic ready to embark on what should be one of the greatest adventures of our lives. With the whole team together again at last, much of the morning was taken up with a flurry of last minute administration. Life jackets had to be individually inflated, rechecked and stowed, vehicles returned, radio interviews given, rations broken down and stowed and custom clearances obtained. As the chain of fresh rations came on board some of the team were more than a little surprised to see two new additions to the team in the form of two whole lamb carcasses. Dolly and Barbara -the afterguard – are now safely lashed to the rear guardrail and will be ‘joining’ us for dinner down south later in the trip. Mid-morning and Antarctic Endurance received a divine blessing …..twice…….! The team were taking no chances inviting two military Padres on board to give us the best send off. Finally the team’s all together! Our stragglers arrived this evening (21 Jan) after another epic, 22 hour flight courtesy of the RAF. The weather in the Falklands has been beautiful today with several of the team suffering unexpected sunburn despite liberal suncream use! We took full advantage of the good weather to literally “learn the ropes” on the upper deck, hoisting sails and learning to “pole out”: use a huge, moveable pole to keep the sails in the right place. Our resident diver Kris was unable to resist the call of the sea: carefully supervised by our skipper Stephen, he jumped in with both feet (and a SCUBA set!) to inspect the hull and propeller. Kris being in the water presented our first unusual photo opportunity with our associated charity’s symbolic baton www.thebaton.co.uk Previously the handle of a battlefield stretcher, this baton has travelled all over the world with various members of the military on expeditions around the world. Its latest adventure has just begun. In an unexpectedly glamourous twist, Her Royal Highness Princess Anne came out of her way to wish us well! Tomorrow we say farewell to Caroline, a French lady who’s travelling the world and for the last few days has been helping us move onboard with excellent cooking and help turning off lights, which some of the team seem to struggle with! As the sun sets tonight over the yacht, the crew eagerly await the detailed weather reports from our expert weatherman (think a poor man’s Michael Fish) for a weather window to open to allow us to sail south. Having settled into the Mount Pleasant Complex, today the team met up with the yacht Xplore to start the first of many briefings and find out where everything is kept on board. The way the briefings were conducted was similar to a game of Chinese whispers, with one person being briefed by Stephen – they then had to brief the next person, and once all briefed the last person will brief him – though with a couple of days until the remaining team members (Tony, Matt B and Shady) are due our memories will certainly be tested. We also found out who we will be sharing our cabins with for the next 6 weeks. They are all two berth cabins with cabin mates on opposite watches, so fortunately no-one will have to put up with Shady’s snoring! Tonight we finish sorting out all our equipment, tomorrow we move on board Xplore and with any luck and a lot of crossed fingers, get the news that the final 3 team members are on their way. The yacht Xplore arrived in Port Stanley on the evening of 12 Jan, amid strong winds and big seas. Tim and Molly went onboard mid morning of 13 Jan to welcome Stephen Wilkins to the start of our adventure together. It provided the opportunity to give each other updates on the project and thus make plans for the coming week and a half. Tim and Molly then had to get back to Mount Pleasant to meet the freight flight and arrange for delivery to the AE16 ‘logistics hub’ (a lockable ISO container in Mare Harbour). All our personal kit that couldn’t go as baggage was there, as was the “RealMeals” from Drytech and the Thomas Mercer Chronometer. This was removed from layers of careful packaging to be found running in perfect time and looking fantastic! Now all we need is the rest of the AE16 Team! Tim Winter and Molly Macpherson headed down to the Falklands on 06 Jan to conduct preparations ahead of the rest of the team arriving a week later. They are based at the military airbase at Mount Pleasant and have been busy scrounging batteries for safety equipment from the stores and maps of the Island from a headquarters for team training, buying gas for the cookers from the supermarket in Stanley – all stuff that couldn’t be brought on the flight very easily. It helped having Molly here, as being a veteran from ’82 has given access to vehicles, including a helicopter flight to take the team into the centre of East Falkland for training. However, with the yacht Xplore braving blustery conditions (storm force winds and snow) in order to arrive in Stanley tomorrow, the flight for the rest of the team has been delayed by at least 3 days, throwing all the short term plans up in the air. Despite frantic efforts to make some last minute alternative arrangements, all we can do is wait. Thankfully the generosity of some of the Service and ex-Service people out here softens the blow a little!